On 9 May 1937, the 750 kilogram W 125 racing car from Mercedes-Benz celebrated its racing debut with a victory at the Tripoli Grand Prix. Following this opening triumph, it went on to dominate the entire season – yet it would prove to be its one and only season. This was because 1937 was the last season in which the 750 kilogram weight limit was the formula applied for the Grand Prix European Championship. The drivers from the Stuttgart-based racing team won four of the five Grand Prix races that counted towards the European Championship in the W 125. This included two 1-2-3 and two 1-2 finishes. At the end of the season, Rudolf Caracciola was crowned European Champion for the second time. The W 125 also racked up some great successes in other races and on record-breaking drives. The goal was an extremely ambitious one: produce a brand-new Mercedes-Benz racing car within the space of just a few months in time for the 1937 Grand Prix European Championship. This was the task that the young engineer Rudolf Uhlenhaut, who was technical director of the Stuttgart brand’s newly created racing department, set his team of design engineers in the summer of 1936. It was necessary because the first of the legendary Mercedes-Benz Silver Arrows models, the W 25, could no longer compete with the Auto Union racing cars, its fiercest rivals. It was quite clear what the new racer, christened the W 125, needed: a more torsion-resistant frame, different suspension tuning, a more powerful engine, plus further modifications besides. In August 1936, the design engineers got to work on the development of the racing car, which would compete in 1937 as the W 125. The established concept of the first Silver Arrow car needed to be completely rethought. By 9 September 1936, Josef Müller already had an overall design ready that included all the characteristics of the final racing car. The wheelbase was extended from 2505 to 2798 mm. And fitting oval tubes as longitudinal members and circular tubes as cross members increased the frame’s torsional stiffness by a factor of 2.65 compared with the W 25. The suspension’s set-up featuring soft springing and strong damping was nothing less than revolutionary. The developers of the W 125 achieved this by using a trapezoidal link front suspension with coil springs and a de Dion rear suspension with reduction of the roll center. Front and rear spring travel grew significantly, with an increase of 50 mm at the front axle to 140 mm. The aerodynamics of the body with its distinctive three cooling openings in the front end were also improved, lowering the Cd figure from 0.620 to 0.589. When considered from a modern standpoint, the development of a brand-new engine bears particular testament to the visionary power and boldness of the project. For 1937 would be the last season in which the 750 kilogram weight limit was the formula applied – in 1938 a new formula based on engine displacement was to be introduced. This meant it would no longer be possible to use the new power unit in motor racing’s most elite event. But all those involved, from the company management down, gave their full backing to the plan. With engine designer Georg Scheerer overseeing development, the result was the M 125 – an eight-cylinder inline engine with a Roots-type supercharger and a displacement of 5660 cubic cc. In the races held during the 1937 season, the W 125 attained speeds in excess of 300 km/h. In the process, its engine generated between 409 kW (556 hp) and 430 kW (585 hp), while on the test stand, output was even higher at 475 kW (646 hp). 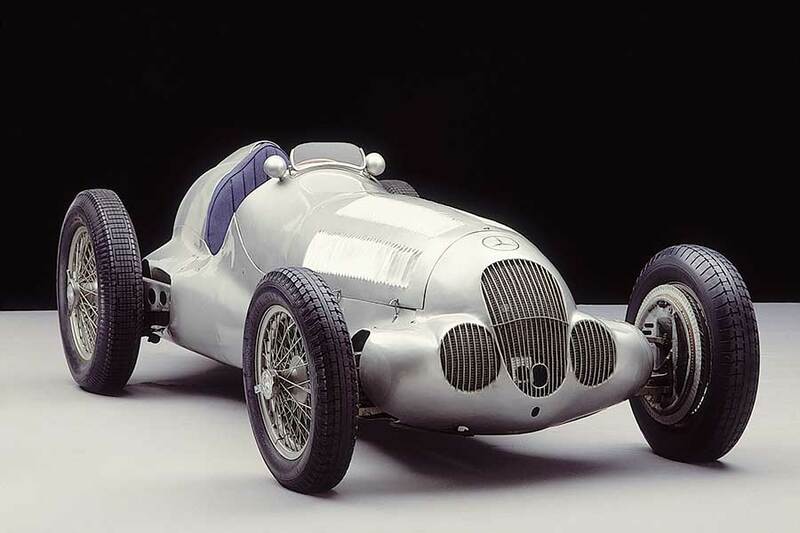 Silver Arrow on course for gold: the Mercedes-Benz W 125 built for the 750 kilogram weight limit in 1937. 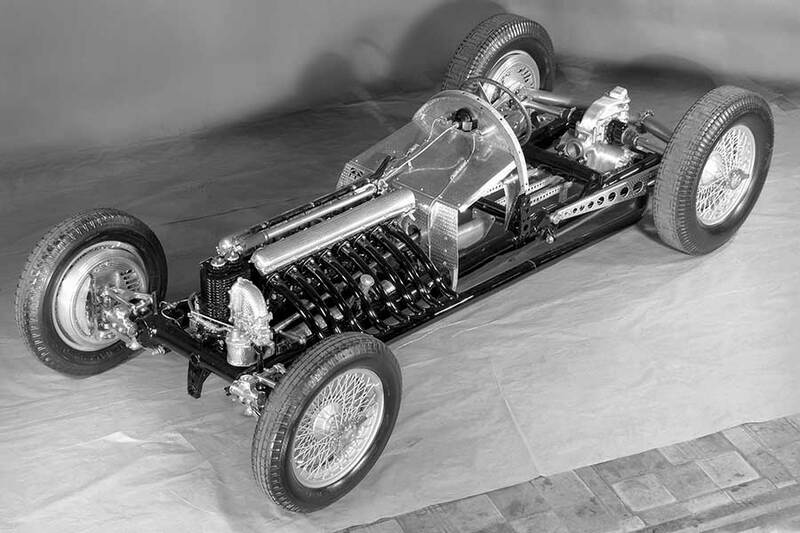 Revolutionary design: exhibition model of the Mercedes-Benz W 125 Grand Prix racing car for the 1937 season. The first of a total of eleven W 125 cars was finished in February 1937 and underwent initial testing in Monza with Rudolf Caracciola and Hermann Lang at the wheel. It made its racing debut in early May at the Tripoli Grand Prix, which Lang promptly won. Originally from Stuttgart, Lang recorded an average speed of 212.5 km/h on his way to his first ever Grand Prix triumph. During the remainder of the 1937 motor racing season, the new Silver Arrow triumphed over its rivals exactly as hoped. Mercedes-Benz won four of the five Grand Prix races that counted towards the European Championship. There were 1-2 finishes at the German Grand Prix on 25 July (Rudolf Caracciola followed by Manfred von Brauchitsch) and at the Italian Grand Prix on 12 September (Caracciola followed by Hermann Lang). And Mercedes-Benz achieved a clean sweep of the podium at the Monaco Grand Prix on 8 August (von Brauchitsch followed by Caracciola and Christian Kautz) and at the Swiss Grand Prix (Caracciola followed by Lang and von Brauchitsch). At the end of the season, Rudolf Caracciola was crowned Grand Prix European Champion for the second time following his 1935 triumph. And Caracciola would pick up his third title the following year in another racing car developed completely from scratch, the 3-litre W 154. 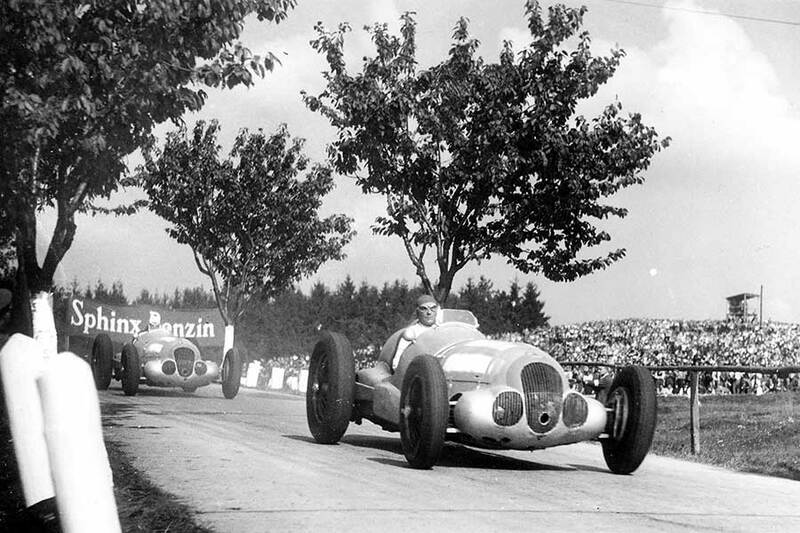 Victory at debut race: Hermann Lang (leading) won the 1937 Tripoli Grand Prix in the W 125. Manfred von Brauchitsch ahead of Richard Seaman at the Masaryk Grand Prix in Brno. 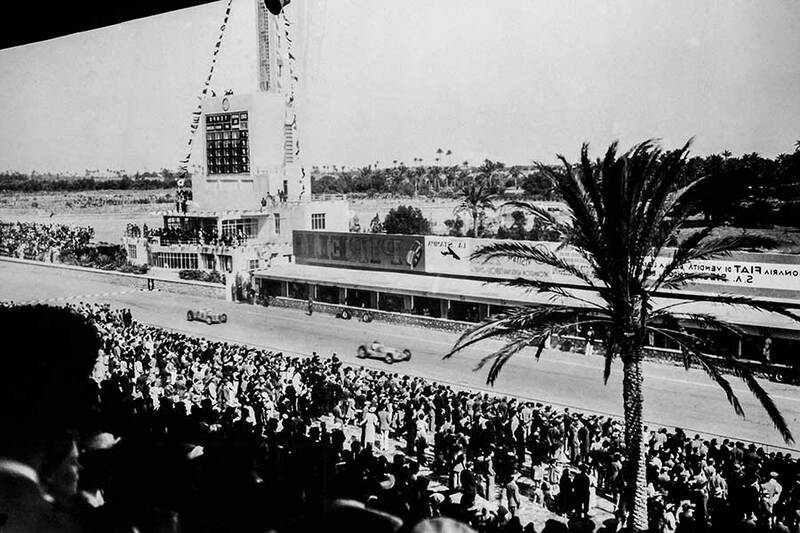 They finished in 2nd and 4th respectively, with Rudolf Caracciola winning the race. There were further victories for the Silver Arrow car during 1937: at the International AVUS race in Berlin on 30 May, in which a car from the previous season also competed (1st run: Caracciola, W 125; 2nd run: von Brauchitsch, W 25 short; final run: Lang, W 125; all cars fitted with streamlined body) and at the Masaryk Grand Prix, Brno on 26 September (Caracciola). The W 125 was also used by Mercedes-Benz for record-breaking attempts and hill climbs with great success. On 28 January 1938, Rudolf Caracciola bettered various international Class B speed records in a W 125 with full cladding during record-breaking drives on the autobahn between Frankfurt am Main and Darmstadt. The car was powered by a 541 kW (736 hp) 5.6-litre twelve-cylinder engine. Caracciola covered one kilometre with a flying start at a speed of 432.7 km/h and one mile with a flying start at 432.4 km/h. These marks still stand today as the highest speeds attained during a record-breaking attempt on a public road.